Samurai rocks are rugged and beautiful. See below for the best deal on Samurai Rock. Big Savings on Samurai Rock! Samurai rocks are rugged and beautiful. The deep, rusty brown colour almost seems to glow. 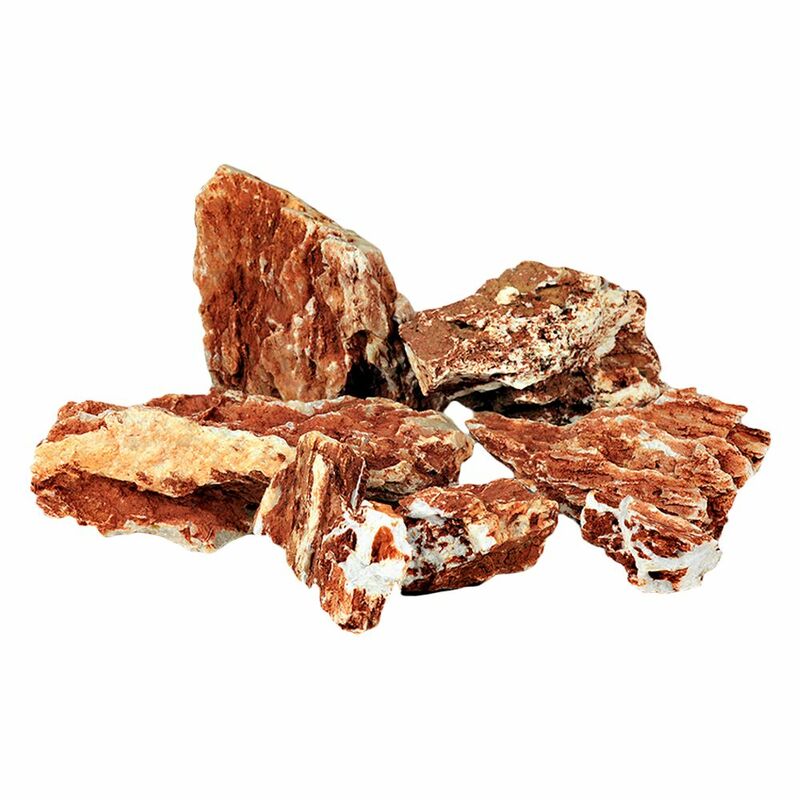 These earth coloured rocks are shot through with bright white quartz and look stunning when combined with the contrasting bright green of aquatic plants. Samurai rocks can be used to create an amazing, exotic atmosphere in your aquarium. At zooplus you can now purchase the bizarre, beautiful samurai rock in a practical set, suited to various aquarium sizes. The unique, individual shape of each rock gives you endless possibilities for constructing creative and exciting landscapes in your aquarium take your inspiration from the bizarre and fascinating natural shapes of the rock itself. The possibilities are endless! The sets contain a selection of rocks in various sizes suited to the particular size of aquarium. Please note:: As these products are natural and each is unique, the product delivered may differ in size, shape and colour from the picture shown. Samurai rock can slightly increase water hardness. It might be necessary to add soft water. Samurai Rock - Aquarium Decoration at a glance: A vibrant, earth coloured rugged rock which is perfect for aquatic "sunset scenes" Amazing natural structure, great for constructing unique landscapes Ideal for aquariums decorated in a natural, Amano style Easy to create mountain formations using a mix of small, medium and large rocks Available in practical sets (60cm, 80cm, 100cm, 120cm) - to suit your aquarium size! Features: 60 cm Set 80 cm Set 100 cm Set 120 cm Set Aquarium size in litres (approx. ): 54 - 84 Litres 72 - 128 Litres 160 - 250 Litres 192 - 400 Litres Rocks included: 1xL / 3xM / 5xS 1xL / 5xM / 5xS 1xXL / 1xL / 3xM / 5xS 1xXXL / 1xXL / 1xL / 3xM / 5xS Total number of rocks: 9 11 10 11 Weight in kg/Set: approx. 6.0 kg approx. 8.0 kg approx. 13.0 kg approx. 24.0 kg Rock sizes: XXL: approx. 35 cm, XL: approx. 25 cm, L: approx. 16 cm, M: approx. 12 cm, S: approx. 6 cm Water qualities: Slightly chalky Important information: This product will be delivered direct from the manufacturer therefore shipping within 24 hours cannot be guaranteed. The delivery time will be 3-5 working days. * Your invoice will be send by email as a PDF. The products can be delivered in the UK. Please make sure that someone will be available to take delivery of the product at the specified delivery address. The Right of Withdrawal does not apply to perishable goods or those made to specific customer requirements. *Where available, delivery will be within the specified number of working days. The delivery period begins when the order is dispatched except in the case of pre-payment. The delivery period for this begins the day after you instruct payment. If the last day of the delivery period falls on a Saturday, Sunday or public holiday, the deadline is automatically extended to the next working day. The NanoNature range of products from Oliver Knott makes it easy for you to create stunning, natural..
Samurai rocks are rugged and beautiful. The deep, rusty brown colour almost seems to glow. These ear.. The Best Deals online for Samurai Rock and your essential Pet Supply Products. Order over £29 and get FREE DELIVERY on all orders today. Most orders are processed and dispatched within 24 hours from this supplier (zooplus) and their delivery service partners provide online parcel tracking facilities, active from 2-3 days after dispatch of your Samurai Rock order. The suplier 'zooplus' offers International shipping to the countries listed in the table below for shipping on Samurai Rock. Samurai Rock requires a £2.99 Delivery Fee from the supplier for deliveries within Great Britain. Orders over £29 qualify for Free Delivery. This can be checked using shipping calculator to your post code on the suppliers web site when purchasing.